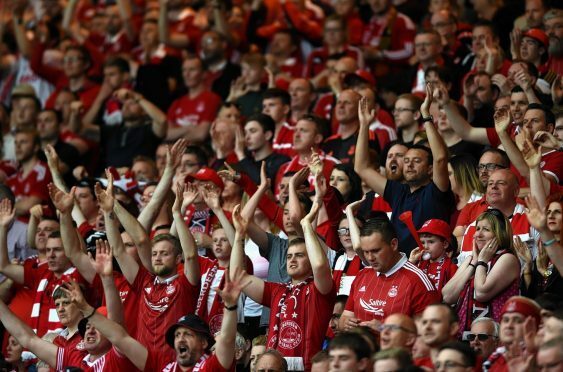 Aberdeen supporters at Hampden Park during last year's Scottish Cup final. Aberdeen’s Betfred Cup semi-final against Rangers has been pushed back to 4.30pm. The game will remain at Hampden Park on October 28, while the Hearts-Celtic game has been moved to Murrayfield with a 1.30pm start. It came after a swathe of criticism, from clubs, fans, politicians and the police, at the SPFL’s original plan to host both games on the same day at Hampden. The governing body announced a rethink yesterday, on the back of a legal obligation to play all semi-finals involving the Old Firm at Hampden Park being waived. That opened the possibility of moving one of the games to the home of Scottish Rugby, although Celtic had asked for a ballot to decide which game would be moved. An SPFL spokesman said: “In reaching our decision, we have consulted with Hampden Park, the Scottish FA, Scottish Rugby, Police Scotland, Transport Scotland via the Scottish Government and with the four clubs involved.